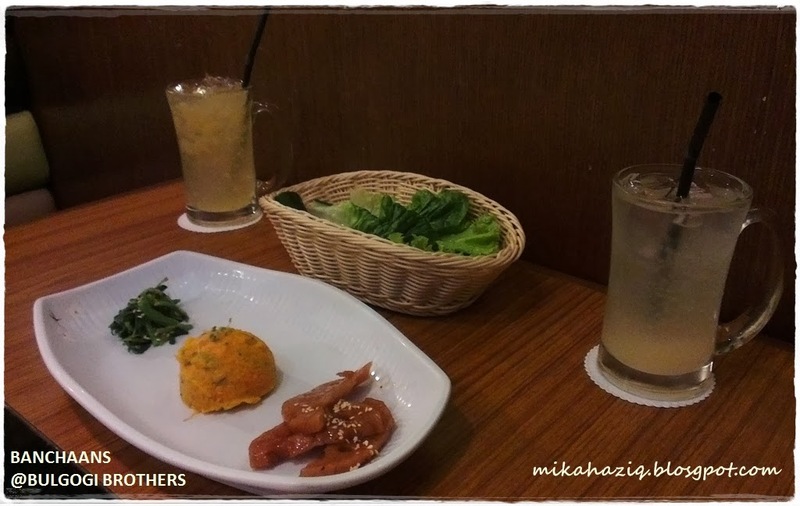 mikahaziq: Korean Restaurant at Pavilion KL : Bulgogi Brothers - Halal? 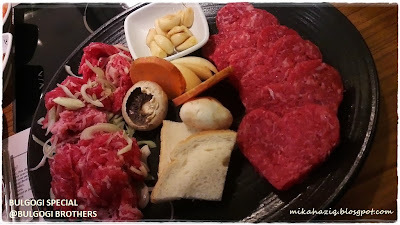 Korean Restaurant at Pavilion KL : Bulgogi Brothers - Halal? Note to Readers : Bulgogi Brothers has closed down all its outlets in Malaysia. Hmm.. after our chanced dining at Dubu-dubu Seoul Food at Berjaya Times Square recently, hubby seems fuelled to find more halal korean restaurants in KL. 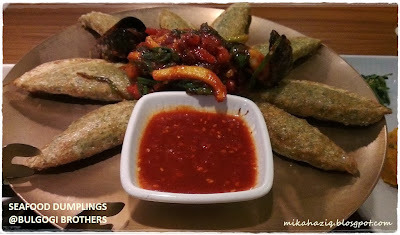 So, while sneaking a movie date with hubby, he insisted I asked the waitress at Bulgogi Brothers whether they are halal.. Being the good wife that I am (yeah right) I duly complied. The waitress was a friendly muslim lady wearing a headscraf and the manager (I'm assuming he is a manager) is a Malay muslim male. They confirmed that their meat come from halal suppliers and they don't use alcohol in their cooking, however they are not halal certified by Jakim as they serve alcohol. For your info, Bulgogi Brothers is owned by the same company that owns TGIF and Italiannies, so whether you accept their explanation or otherwise is really a personal choice to me. Seafood dumplings (haemul gungjung mandu): a fried dumplings with seafood fillings and served with some mussels, squids and prawns side and spicy korean dip. This dish is very nice and very filling. By the time we finished the appetizer, I was already quite full. 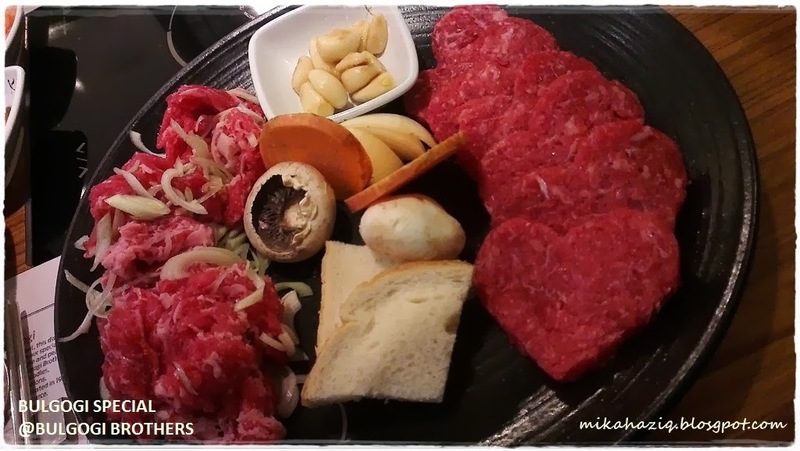 Bulgogi Brothers' Special: This dish is a combination of Unyang Style Bulgogi (seasoned beef and hand pressed into heart shape) and Gwangyang Style Bulgogi (seasoned beef with mushrooms, sweet potatoes, leeks and garlic). It came with 7 banchaans (korean side dishes) and a basket of salad should you want to eat bulgogi the true korean style. The first banchaan that arrived was this, corn, sweet potato and edamame.. 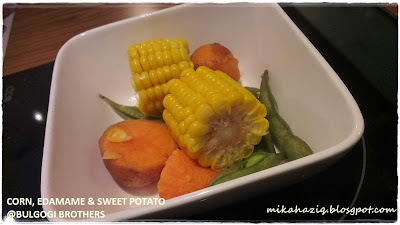 I think they were all boiled.. healthy but ermm.. a bit bland for me.. especially the edamame.. 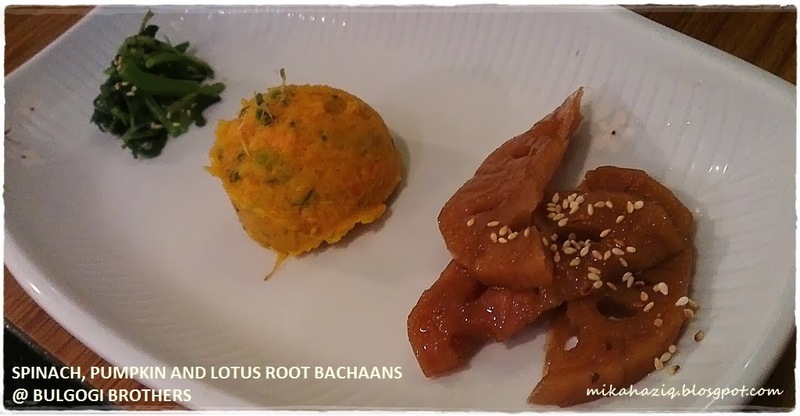 So, the banchans were so many that I was ready to burst before even eating the main. Too much lah for me! Overall, it was a nice visit, a different change to my nasi lemak, mee bandung and tomyam seafood diet haha.. but I find the bulgogi to be tasteless even though it is stated in the menu that the beef are seasoned.. I also tried eating the meat rolled up in the salad leaves provided and seasoned with accompanied dippings but I think I failed miserably. We also ordered Seafood Stew with rice (Haemul Doenjang Jjigae) but I didn't take a picture of it. The seafood portion is quite generous with some crabs, shrimps, vegetables and small cubed tofu. 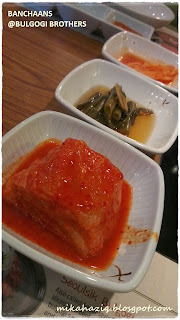 It is not very spicy and I quite like it but hubby said he preferred Dubu-dubu's Soondubu Jigae. The decor of the restaurant is also nice, so I guess it's an option for entertaining guests when they come up to KL for halal korean food but the price is on the high side so I don't think this place will be a regular haunt for us.